Polish flag animations with flag clipart and transparent PNG images. HTML copy/paste code for animated Polish Flag GIF with transparent background. Poland Flag button PNG with transparent background and chrome frame. Button will work well on any color background or image. 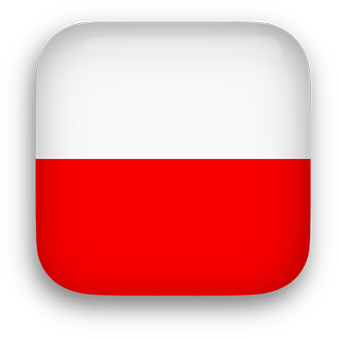 Polish Flag clipart PNG with rounded corners, transparent background and perspective shadow. Poland Flag button PNG round with perspective shadow. Animated Poland Flag GIF with transparent background. Independence: November 11, 1918 republic was proclaimed. Other important dates: A.D. 966 Christianity was adopted (traditional founding date); July 1, 1569 the Polish-Lithuanian Commonwealth formed. National Anthem: "Mazurek Dabrowskiego" (Dabrowski's Mazurka); Adopted in 1927 the anthem is commonly known as "Jeszcze Polska nie zginela" (Poland Has Not Yet Perished). Polish Flag has two equal horizontal bands - white on top and red on the bottom. The colors derive from the Polish emblem - a white eagle on a red field. Polish Flag clipart PNG equal sides, rounded corners, transparent background and perspective shadows. Poland Flag - 550 x 365 pixels - JPEG. General information about Poland provided by The World Factbook.